You may have been lucky enough to find love. You may still be in love and wish to renew your vows. You have a new little soul enter your lives. Either way, I am here to help you create a celebration which will truly reflect your needs. CONGRATULATIONS ON FINDING LOVE; THAT’S THE HARDEST PART. The easiest part is planning the Wedding Day. This Day is ALL ABOUT YOU! My paramount concern is what I need to do to make you both happy for your Special Day. I will do everything within my power to ensure that Your Day turns out exactly how you wish. If you are not exactly sure of the details, together we will make it happen. My job is to see you both smile at all times. If we plan for all contingencies, you will have minimal stress and have fun at the same time. I am “game” for just about anything when it comes to catering for your every need. I will perform your ceremony on a boat, in a plane, in a hot air balloon, on the beach, with a theme, in your garden… and more. No wedding is too large or too small. We have all witnessed boring wedding ceremonies. In fact, my original role within the wedding industry was that of providing white dove releases. Of course, I would arrive prior to the start of the wedding ceremony to take my place. After attending some 50 weddings, I felt that I could have done as well (if not better) in preparing and delivering an interesting wedding ceremony. 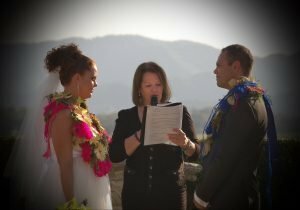 What I have developed is a foolproof method of allowing the couple to initially develop their own wedding ceremony and vows. This then gives me a feel for what type of ceremony you want and allows us to work together to add the finishing touches. Some well-meaning parents, relatives and friends may offer their opinions, suggestions, requests for involvement, etc. Once again “its all about you – not them”! A little innovation and creative thinking is all that is required to incorporate those other parties whom you (or others) would love to include but cannot fit into the official wedding party. We can actually make everyone happy, without compromising your perfect wedding. There is a large range of song suggestions available, to give you inspiration. My portable PA system is available for your use. My base is the Gold Coast but I will travel up to Brisbane and as far south as Byron Bay. However, should you wish to get married in an exotic location or other part of Australia that can certainly be negotiated (Who doesn’t like a short overseas holiday?). We were so thrilled with our wedding. Deborah made it so easy to plan everything with her relaxed and positive attitude to our demands. Our friends could not believe how beautiful the ceremony was in the beautiful gardens. Everything went perfectly on the day. I think the rehearsal with all of my family the Friday night before really helped. 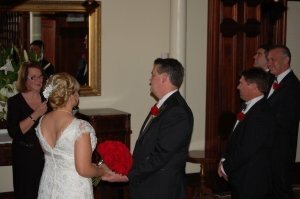 We could not believe how easy it was to prepare a ceremony and how well everything worked out on the day. We were so happy with Deborah’s caring and professional attitude.